Intrahepatic cholangiocarcinoma: can imaging phenotypes predict survival and tumor genetics? On computed tomography (CT), intrahepatic cholangiocarcinomas (ICC) are a visibly heterogeneous group of tumors. The purpose of this study was to investigate the associations between CT imaging phenotypes, patient survival, and known genetic markers. A retrospective study was performed with 66 patients with surgically resected ICC. Pre-surgical CT images of ICC were assessed by radiologists blinded to tumor genetics and patient clinical data. Associations between qualitative imaging features and overall survival (OS) and disease-free survival (DFS) were performed with Cox proportional hazards regression and visualized with Kaplan–Meier plots. Associations between radiographic features and genetic pathways (IDH1, Chromatin and RAS-MAPK) were assessed with Fisher’s Exact test and the Wilcoxon Rank sum test where appropriate and corrected for multiple comparisons within each pathway using the False Discovery Rate correction. 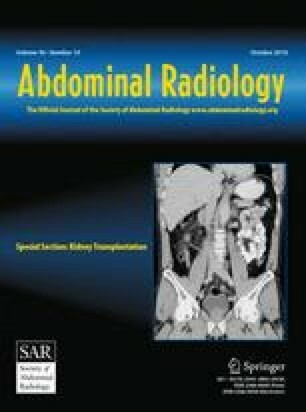 Three imaging features were significantly associated with a higher risk of death: necrosis (hazard ratio (HR) 2.95 95% CI 1.44–6.04, p = 0.029), satellite nodules (HR 3.29, 95% CI:1.35–8.02, p = 0.029), and vascular encasement (HR 2.63, 95% CI 1.28–5.41, p = 0.029). Additionally, with each increase in axial size, the risk of death increased (HR 1.14, 95% CI 1.03–1.26, p = 0.029). Similar to findings for OS, satellite nodules (HR 3.81, 95% CI 1.88–7.71, p = 0.002) and vascular encasement (HR 2.25, 95% CI 1.24–4.06, p = 0.019) were associated with increased risk of recurrence/death. No significant associations were found between radiographic features and genes in the IDH1, Chromatin or RAS-MAPK pathways (p = 0.63–84). This preliminary analysis of resected ICC suggests associations between CT imaging features and OS and DFS. No association was identified between imaging features and currently known genetic pathways. Linda M. Pak, MD, was supported by the Clinical and Translational Science Center at Weill Cornell Medical Center and MSKCC Award Number UL1TR00457. This work was also supported in part by NIH/NCI P30 CA008748 Cancer Center Support Grant.